﻿ Promarc Software Pvt. Ltd.
A website is unique for the business concerned and to ensure that you are its sole owner you will have to consider services of a domain name registra. 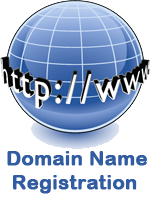 It allows you to have your website registered in an official manner. Hosting services are stated for those users who deal with ASP or .net with Mysql data base. As it is easy to organize and operate without any deep understanding of server side. Highly robust and scalable mail solutions based on Internet standards providing top of the line anti virus & anti spam support.